Why would a black man hang out with the Ku Klux Klan? The answer to that question can be found in the first episode of The United Shades of America, a new CNN original series featuring comedian W. Kamau Bell that debuted Sunday. Over the course of eight episodes, Bell travels to places where "you either wouldn't expect I would go or where I absolutely shouldn't go." KKK compounds in the South would likely rank among the latter, but Bell goes anyway. The result is a combination of hilarious moments and deeply disturbing interactions. The episode's first scene shows Bell driving down a long country road in Arkansas at night (almost all of the compounds he visits are on long country roads). He's going to meet with a man who identifies himself as the Imperial Wizard of the International Keystone Knights of the Ku Klux Klan and is dressed in full KKK regalia. In a Facebook Live interview, Bell admitted to being afraid during the encounter -- particularly because he couldn't see who else was around him. 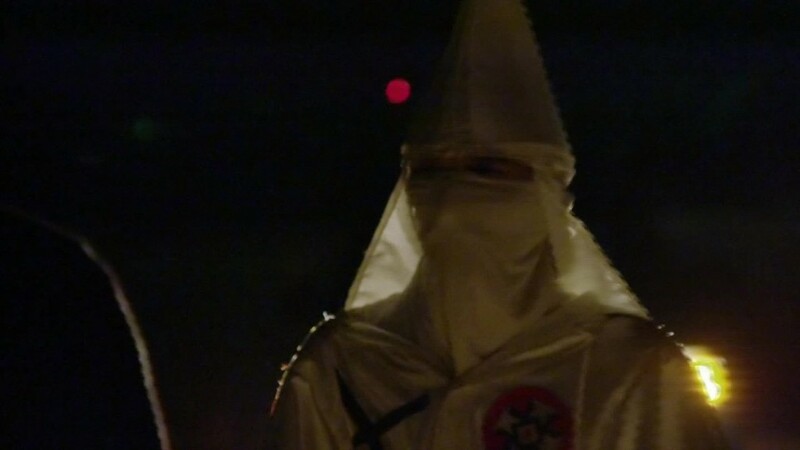 But despite the intensity of the man standing before him, Bell lightens the moment by suggesting the KKK member (whose voice is disguised) add an opening to his mask so people can hear him speak better. The KKK member said he would consider it. Comedy, said Bell, was one of the ways he was able to connect with his subjects. It was also a way to help him deal with the emotionally draining process of being a black man interviewing people who vehemently hate blacks and other people of color. Whenever he was able to get a Klan member to laugh, Bell said he jokingly thought, "Wait a minute white supremacy, I think you just submitted to my black supremacy." While the pièce de résistance in the episode includes Bell witnessing a cross burning in the woods, there were also scenes with Klan members who weren't wearing their robes. In one, Bell meets Pastor Thomas Robb, the national director of the Knights of the Ku Klux Klan, for lunch at a diner in Harrison, Arkansas, where the population is 96% white. In the first episode of his new show, comedian W. Kamau Bell interviews three members of the Ku Klux Klan. "White people have an inner drive for discipline and law and order," Robb said during the interview. "All white people?" asked Bell, lightening the moment with a laugh. "Not all white people," said Robb "Some are really trash." Robb goes on to explain to Bell that "if people of my character and racial integrity were in charge, your communities would be safe again." Bell probes deeper, asking Robb whether he would ever come to his house for dinner. Robb declines. Despite his sense of humor, Bell said he never forgot the weight of the horrifying role that the Klan played in terrorizing blacks throughout U.S. history. "Those robes carry a lot of weight," Bell said "I never got that far from it. I never could disconnect from it. Most black people, most people of color who got that close to the Klan probably didn't get away alive." Explore the nation's most interesting subcultures with comedian W. Kamau Bell and learn how our differences unite and divide us. United Shades of America airs Sundays at 10 p.m. starting April 24.